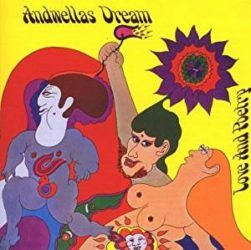 A vinyl reissue of Andwella’s Dream’s lone album, originally released in 1969 on CBS, and highly regarded by psychedelic collectors. This eclectic affair touches upon a number of approaches. It contains heavy progressive rock-tinged psychedelia with keyboards, fruity pop-psych with strings and fairytale-type lyrics, and folk- and blues-informed material bridging psych and prog. After this release the group changed its name to Andwella and subsequently recorded a couple of albums under that moniker.